If you don't understand why we should say 'Black lives matter,' " the panelist said to the audience, "and why we shouldn't then say 'All lives matter,' then come and see me afterwards. I'd love to have a chat with you." The invitation that evening was straightforward: examine your relationships with minority communities. Understand the injustices committed against our black brothers and sisters for well over 300 years on American soil. Understand systematic racism still prevalent in our country today. And understand why African Americans have a right to be angry and why justice has yet to happen for the black community. 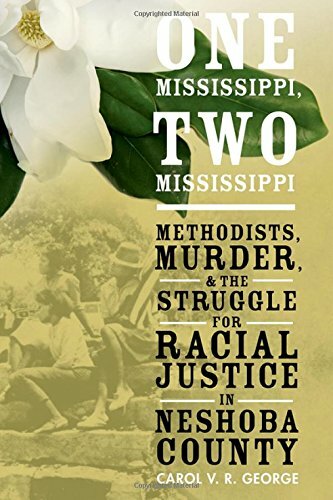 Like that conversation, Carol V. R. George's One Mississippi, Two Mississippi is a step in the right direction. George's multilayered book sheds light on the role the Methodist Church played (and chose not to play) regarding equal rights for blacks, particularly in the South. It zeroes in on the history of one small congregation, Mt. Zion Methodist Church in Philadelphia, Mississippi, and its contribution to the greater fight for racial justice. George highlights the conscious decision the congregation made to promote voter registration during the Freedom Summer of 1964—a commitment that resulted in the brutal beating of five church members and a fire that destroyed the original church building—and revisits the notorious murder of three young civil rights workers who had come to investigate the church-burning.